Gentleman’s Quarterly, more commonly known as GQ Magazine, is one of the most respected voices for the daily life and improvement of today’s modern man. 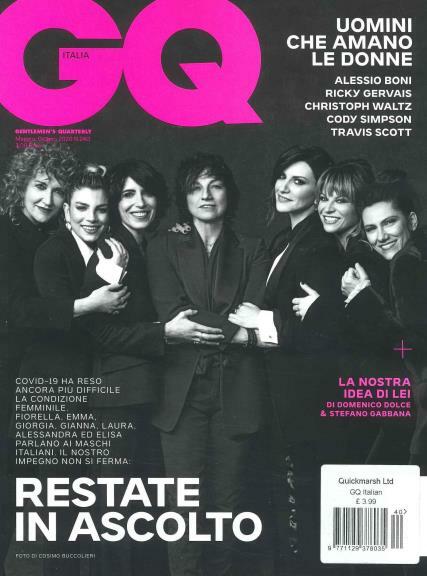 Buy a single copy or subscription to GQ Italian magazine. Serving as a roadmap that seeks to guide men into what it means to have style, fashion, and culture, GQ is always featuring innovative styles, reviews, and culture advice for men while trying to show and mould their readers into what it means to be the perfect gentleman. Featured throughout the world in numerous countries and languages, Italian GQ is just one of those roadmaps that showcases Italian culture and fashion, where men can learn to look like an Italian, think like an Italian, and even eat like an Italian. The magazine features leading designer products like Dior, Hugo Boss, Swiss Watch, Dolce & Gabbana, Diadora, and many others, all the while trying to draw men into these products by offering intriguing and compelling ads that feature men using these products while experiencing adventure, love, and a party lifestyle that GQ expresses with exquisite certainty. From clever advertisements to numerous thought-provoking articles, including political commentary, style advice, reviews, Italian girls, and sports, GQ Italian sets the stage for what it really means to be an Italian gentleman.